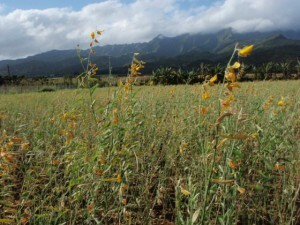 Cover crops offer many benefits to Hawaiʻi farmers: reduced soil erosion, improved soil fertility, increased soil moisture, weed suppression and more. 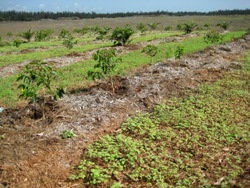 Demonstration plantings at 14 farms across Hawaiʻi show that cover crops are cost effective and can be adapted to a variety of crops and soil types. Oʻahu RC&D has partnered with Crop Care Hawaiʻi, UH-College of Tropical Agriculture, USDA-Natural Resources Conservation Service (NRCS) and Hawaiʻi Agriculture Research Center (HARC) to conduct a total of 14 cover crop demonstrations throughout the State of Hawaiʻi. The demonstrations evaluated cover crops in a variety of agricultural settings; ranging from short term row crops (e.g. seed corn and tomatoes) to long term orchard crops (coffee and koa). Demonstrations were located on the islands of Oʻahu, Molokaʻi, Kauaʻi, Maui, and the Big Island. Each test site consisted plantings of the cover crops sunn hemp (Crotolaria juncea), buckwheat (Fagopyrum esculentum), and oats (Avena sativa) as well as a combination of sunnhemp + buckwheat and sunn hemp + oats. In some cases, the cover crops were planted prior to the cash crops, data collected, and the cash crops planted on the cover cropped areas. In the case of established plantings, cover crops were inter-cropped. In all cases, the land managers were consulted to establish a demonstration that fit into the current agriculture system and crop rotations. These tests showed a definite decrease in weed growth, resulting in decreased herbicide use. Sunn hemp was shown to decrease numbers of destructive root-knot nematodes. In all cases, cover crops reduced the potential for erosion.